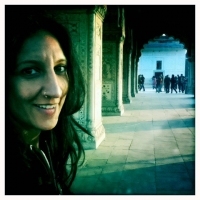 Sarita Khurana is a director, producer, and writer whose work focuses on South Asian stories, and female subjectivities. Sarita Khurana’s feature film, A Suitable Girl, world premiered in the 2017 Tribeca Film Festival documentary competition section, and won the Best New Documentary Director prize. A Suitable Girl has screened internationally at festivals including Sheffield, Hot Docs, Mumbai Film Festival, and AFI Docs. Khurana’s short film What Remains (2013), a collaboration with visual artist Chitra Ganesh, screened at festivals internationally and was featured in exhibitions at the Brooklyn Museum of Art and the Göteborgs Konsthall in Sweden. Khurana’s documentary Bangla East Side (2004), about Muslim youth in New York City just after 9-11, was awarded a NY Times production grant, and is distributed by Third World Newsreel. Khurana also produced Personality (2008), a feature documentary about aspiring background dancers trying to “make it” in the highly competitive Bollywood film industry. Khurana holds a B.A. from Oberlin College, an Education Masters from Harvard University, and an M.F.A in Film Directing from Columbia University’s School of the Arts. In 2009, she was honored as one of NY Women in Film & Television’s notable “Emerging Female Directors.” Her films have been supported by the Tribeca Film Institute, the International Documentary Association, NALIP-Diverse Women in Film, Art in General, the National Film Development Corp of India, Women in Film-LA, New York Foundation for the Arts, and Film Independent. In 2008, Khurana co-founded Cine Qua Non Lab, an international development lab for feature films, based in Mexico and the U.S. Recent projects include And Breathe Normally, winner of the Sundance 2018 World Cinema Dramatic competition; Museo, winner of the 2018 Silver Bear Screenplay award at the Berlin FF; and La Jaula de Oro winner of the 2013 Un Certain Regard prize at Cannes. Sarita Khurana lives and works in Brooklyn, NY.